June 8, 2010. Jeremiah's Vanishing New York has written a three-part thriller investigating the potential locations for Hopper's famous diner. Start with Part I here. In the immediate weeks following Pearl Harbor, the attack that propelled the nation into World War II, Edward Hopper was busy painting a new canvas. He made several preparatory sketches for a scene at a diner. These sketches and studies included a seated man in a hat shown from the back, one of a man seated at the counter and leaning forward and another of a woman, sketches of the coffee maker, a salt shaker and other counter necessities. Hopper made studies for the general shape of the diner as seen from the outside. The eatery sat on a corner intersection of a city and featured a dynamic curve and large windows, these more like transparent walls, and he roughly penciled in the angle of the street behind the building. The point of view is that of a pedestrian passing along the street at night. Hopper: "[Nighthawks] was suggested by a restaurant on Greenwich Avenue where two streets meet. Nighthawks seems to be the way I think of a night street. 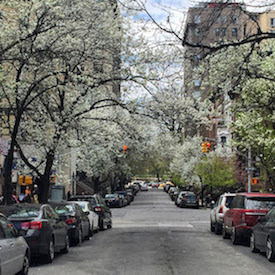 Following in Hopper's footsteps, I walked from the place where he lived on Washington Square North to the intersection of Greenwich and Seventh Avenues to visit the location of the demolished diner. On this spot, a high chain link fence, dotted with hundreds of individual tiles to commemorate the events of 9-11, surrounds a mostly empty lot used to store equipment. Based on my conversations, I believe many locals know about the Nighthawks story, and from time to time, someone will propose a new plan for this corner lot. Stand at a certain spot on the Seventh Avenue side of the intersection and squint your eyes. An icon of American culture may appear. Image: Dayhawks (2009). 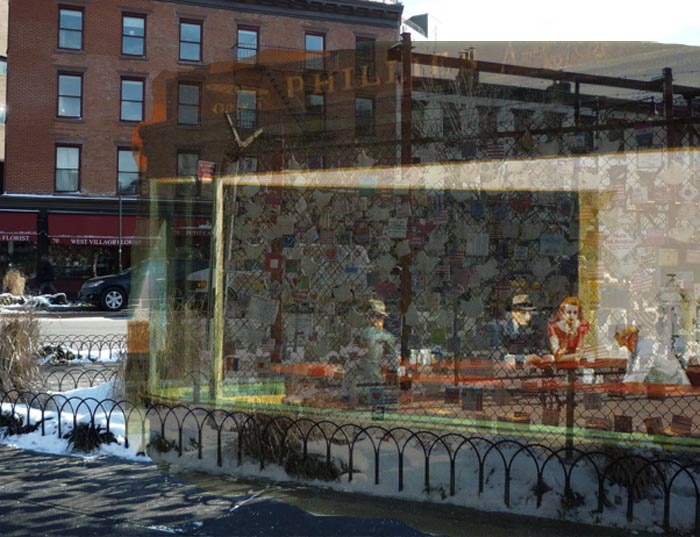 Photoshop image of the diner section of Hopper's Nighthawks superimposed on an image of the southeast corner of Seventh and Greenwich Avenues, taken by Walking Off the Big Apple on February 4, 2009. Nighthawks (1942), oil on canvas, 33 1/8 x 60 inches, by Edward Hopper is in the collection of the Art Institute of Chicago. 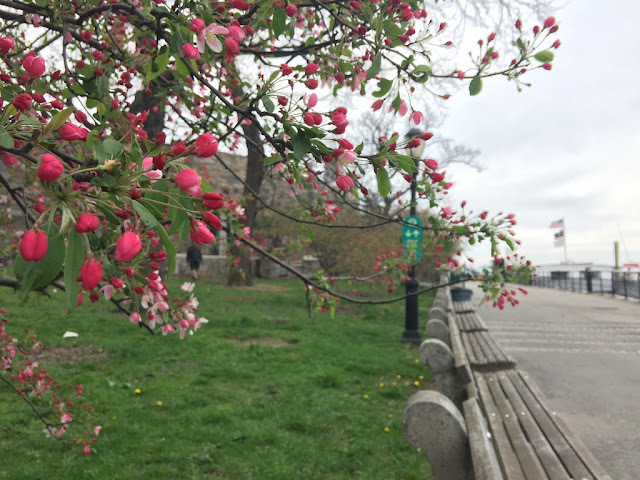 This post is part of a series about the New York of Edward Hopper. See the walk and location on a map at this follow-up post.